Please contact us if you’re also a friend of type or if you need a friend-for-hire: hello@friendsoftype.com or find us on twitter @friendsoftype. Friends of Type features original typographic design and lettering – fresh visual content – practically every day, by the four primary contributors. Posts are meant to log ideas, express ourselves, and inspire each other and our readers. The last week of every month we feature a guest designer, someone we admire and think will elevate our work and the site through their contribution. This is a sketchbook, an archive, a dialogue. The posts are sketches and ideas on visualized language; a collaborative habit born out of the realtime interactions that made us friends in the first place. Typography is the craft of endowing human language with a durable visual form, and thus with an independent existence. Its heartwood is calligraphy – the dance, on a tiny stage, of the living, speaking hand – and its roots reach into living soil, though its branches may be hung each year with new machines. So long as the root lives, typography remains a source of true delight, true knowledge, true surprise. Not all of what we post is set type, nor is it all hand rendered one-offs. It is however inspired by one and could become other. We are, in the end, friends of type, not necessarily purveyors of type. 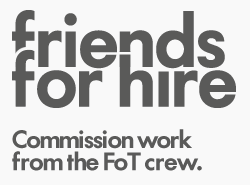 Anyway, Friends of Lettering isn’t a very catchy URL. The four of us have worked together at various institutions and in various roles, recognizing in each other a shared interest in quality design and, in particular, in well crafted type and lettering, but with unique perspectives and talents towards achieving that standard. In September of 2009 at 7pm EST Erik sent Aaron a sketch. Aaron said, “You should post that!” To which Erik replied, “Where?” So we joked about some names, Aaron bought a domain, designed and built a site, and there you go. 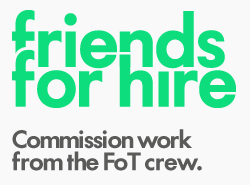 8 hours later (excluding dinner), at about 4am EST and 1am PST, Friends of Type launched.